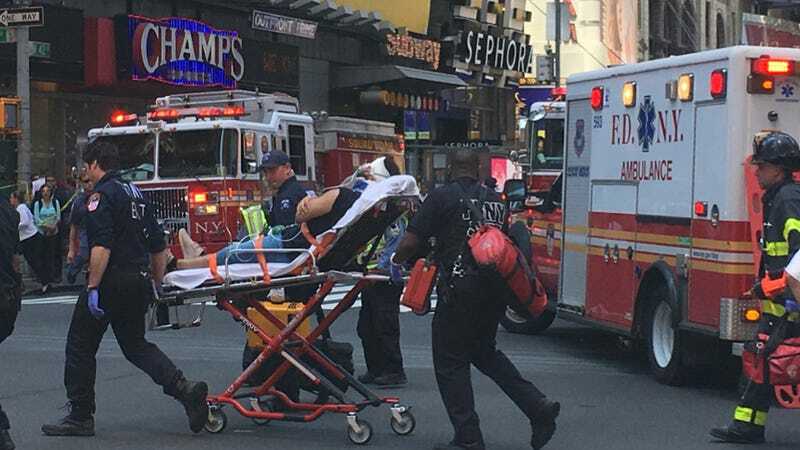 A man has been taken into custody Thursday after police say a vehicle struck a crowd of pedestrians in Times Square, leaving one person dead and at least 22 injured. Authorities said it didn’t appear to be an act of terrorism. A spokesperson for the New York Police Department told Jalopnik that the driver, a 26 year old male, was arrested after the crash around 12:15 p.m. Thursday. The vehicle involved in the incident could be seen on two wheels after coming to a halt on a lamp post, near the intersection of 42nd and Broadway. The driver, identified as Richard Rojas, a Bronx resident, had two prior DWIs in 2008 and 2015. NYPD cordoned off several blocks surrounding the crash, while passersby haphazardly attempted to take photos of the scene. Around 11:55 a.m., police say a 2009 Honda Accord “mounted” the sidewalk at W. 42nd St. & 7th Avenue, striking a total of 23 people. Police officers and civilians apprehended the driver, and 22 people have been taken to the hospital for treatments; four are in critical condition. None of the injured victims are expected to die, officials said. The deceased was identified as an 18-year-old female. Police told reporters that the driver made a U-turn on 7th Avenue and rode along the sidewalk from 42nd St. to 45th St. The driver had been traveling the wrong way down 7th Avenue, said Rob Levine, 33, who left his office at 3 Times Square moments after the crash. When he stepped outside, he saw five people injured and one who appeared to be dead. At the moment, he said, everyone in the vicinity seemed in shock. “Then, 20 seconds later, a huge police presence came in,” Levine, an employee at the Thompson Reuters headquarters, said. A witness to the crash who declined to be named described a frantic scene following the crash that, as he saw it, looked intentional.